A coopered vessel is made from wood. The wooden sides are shaped at an angle and are called staves. Two common types of coopered vessels are the bucket and the piggin. The bucket is similar to those used today with a handle. The piggin is seldom seen but has a long handle and was traditionally used for milking or maple sap collection. 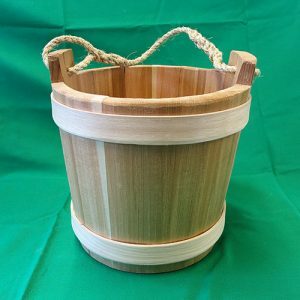 My buckets are made from either cedar or basswood. 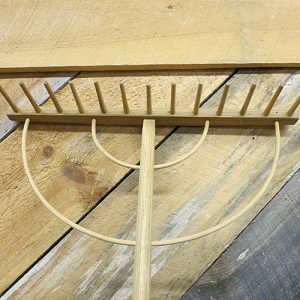 The bucket staves are individually jointed. The staves are held together with either wood or metal bands. The metal bands are riveted in a traditional manner. The wooden bands are usually made of white oak or ash and have a hand-carved, interlocking notch and arrow joint. The buckets are watertight after they sit a short time with water in them. Handles are usually made from rope and secured with a knot or braided eye. Some bucket styles have a metal bale with a small forged eyelet. These are individually handcrafted items and variations in size, material and wood color are to be expected. The descriptions on the following pages are intended to be a fair and honest representation of the work done in my shop.